Our next Members exhibition will be running from 13th January to the 25th of February. Within these dates we have St Dwynwens day (January 25th) and St Valentines day (14th February). With that in mind we are asking Members for submissions for an exhibition entitled ‘When Love Speaks’, which will be held in the main gallery room. 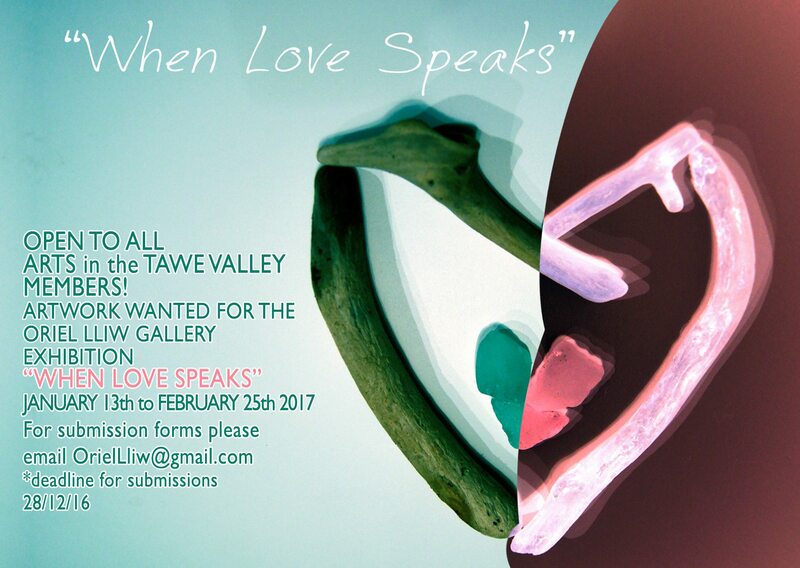 If you are a Member of Arts in the Tawe Valley you can to submit up to four pieces of work for our consideration. We look forward to seeing some fantastic responses to this theme. Please ensure that you have read the form throughly before completing it. Please complete the document digitally without altering the format including the font as this saves us a huge amount of time when it comes to completing the paperwork this end. Please also ensure that you label your image files as requested so that they can be identified by the curators.